The Commonwealths public access program is the responsibility of the Departments Director of Fishing and Boating Access, John P. Sheppard, and the Public Access Board. 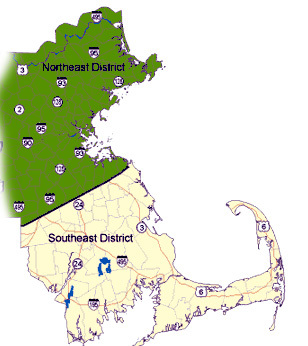 The public access program provides boat and canoe access sites at more than 200 locations on coastal waters, great ponds and rivers throughout Massachusetts. The Department, in conjunction with the Board, acquires property and easements for the purpose of providing access and designates roads and facilities to be built, improved, operated and maintained. Boat launching facilities are managed by staff from the Division of Fisheries & Wildlife, the Department of Conservation and Recreation, and municipalities. This page provides general information about site selection as well as detailed descriptions of the sites themselves, many including maps. Click on the map to view Public Access graphically.